Again, another successful chiffon attempt and this time I baked Orange Chiffon, my kids favourite. It was a great surprise when I see all the comments left in my comment box. I never get so many comments at one time. I'm so happy. Thank you so much my dear friends!! 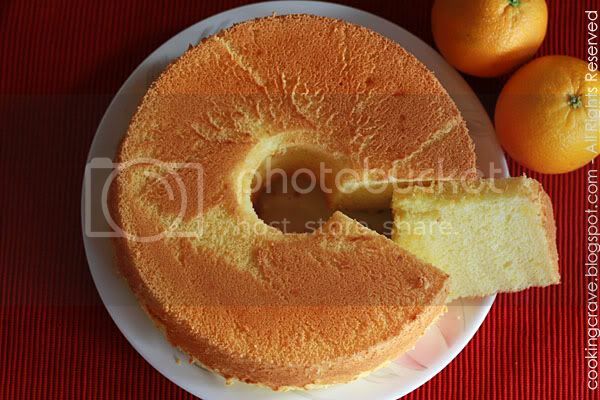 I decided to post the recipe of this Orange Chiffon now and let any of you who interested, can try it out. This is a good recipe and a successful one. Anyhow, this is my second time baking it. My first Orange Chiffon was snapped up in few minutes time, eaten by my group of girlfriends when they are at my house to see me demonstrate and show them how to bake chiffon the other day. I don't even have any chance to take a picture. 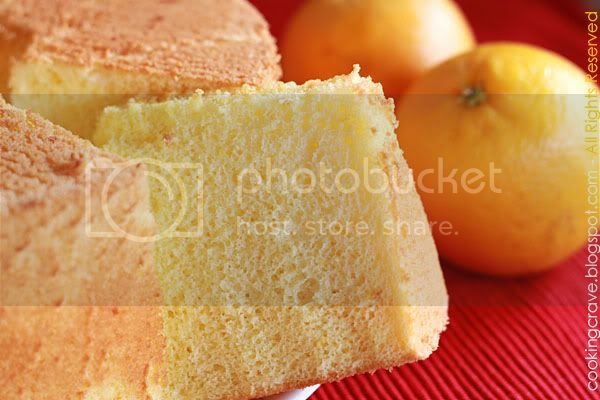 The first Orange Chiffon turn out just as GREAT as this one. So, I truly recommend this recipe for all of you to try out. Recipe adapted from Kevin Chai's ~ Chiffon Cake Is Done and I made some changes to suit my tastebuds. Here we GO!!! 1/2 tsp cream of tartar ~ I substitute it with 15g (approx: 1 tbsp) corn flour. Prepare the egg yolk batter: In a mixing bowl, combine egg yolk, salt and sugar. Hand whisk till the sugar dissolved. Add in oil, orange rind and orange juice. Stir till well combined. Fold in flour until it forms batter and no lumps left. Set aside for later use. Gently fold the beaten egg whites foam into egg yolks batter until it is well blended. Pour batter into ungreased 9" (22cm) chiffon pan. Bake in preheated oven at 170c for 30-40mins or until it is cooked. Remove from oven and immediately invert cake onto table until it is completely cooled before unmould it. Note: For those who still new in baking chiffon, egg yolks and egg whites have to be seperated and place in different mixing bowl. Make sure you use the clean bowl and beater, free from oil to beat the egg whites. The process of beating egg whites are very important, make sure it is already in stiff peak foam before you started to mix it in the egg yolk mixture. Click HERE to see my Orange Poppy Seeds Chiffon. This will be my next Chiffon, look just refreshing and yummy..I like to use fresh fruit to bake Chiffon nowadays..
Nicely baked chffin cake! You've master on it! That looks perfectly light and fluffy! Looks so yummy, can share some with me? Sonia: Ya, this cake is refreshing indeed. I can smell the tangy orange smells from the oven when baking this. Cherry Potato: Yep, it is!!! Lay Yin: Hey girl, how have u been?? Come over to my house and I will bake you one. friend...seems like you are addicted to chiffon cake already?? haha... good job! Giggle: LOL~ ya, I have successfully master it by now!! très joli gateau, il faut que j'essaie il ma fait variment très très envie, peut être avec du citron en lieu et place de l'orange ou les deux, je ne sais pas encore mais je vais essayer ! This looks so yummy! I can't wait to try this! I've tried your chocolate marble recipe and it turned out great! This looks just awesome awesome! !Bookmarked to try as soon as I get my tube pan!! !